Caffeine Free Diet Coke, originally uploaded by Lukasmummy. Credits: Layered template (Tempted Volume 2, Template 2) by Jenn Lindsey, Getting Started Journal Prompts by Krista Sahlin (Sahlin Studio), Scatter Overlays by Megadoodle Inspired, Elegant Comfort (slightly recoloured) by Joelle Lester (Daphadilly Art), Button from Falling In Love by Jaime Rhinehart (Cjoy2Day Designs) and Joelle Lester (Daphadilly Art) and Bubbles from June Wedding Mega contribution by Jaime Rhinehart (Cjoy2Day Designs). Font is Corbel. 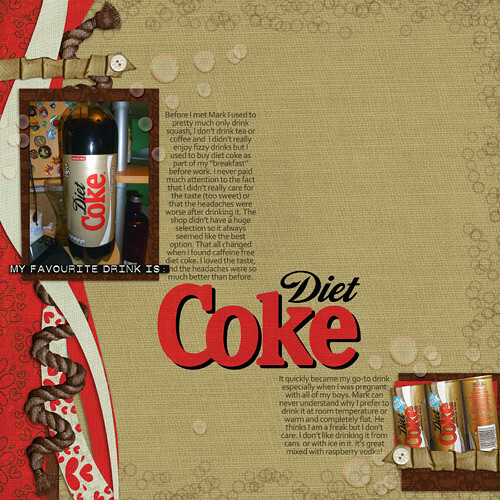 Diet Coke Logo from Vectorlogo and Coke Cans image by Dave from picasaweb.google. Journalling reads: Before I met Mark I used to pretty much only drink squash, I don’t drink tea or coffee and I didn’t really enjoy fizzy drinks but I used to buy diet coke as part of my “breakfast” before work. I never paid much attention to the fact that I didn’t really care for the taste (too sweet) or that the headaches were worse after drinking it. The shop didn’t have a huge selection so it always seemed like the best option. That all changed when I found caffeine free diet coke. I loved the taste, and the headaches were so much better than before. It quickly became my go-to drink especially when I was pregnant with all of my boys. Mark can never understand why I prefer to drink it at room temperature or warm and completely flat. He thinks I am a freak but I don’t care. I don’t like drinking it from cans or with ice in it. It’s great mixed with raspberry vodka! Dia De Los Muertos, originally uploaded by Lukasmummy. Credits: Layered template (Temp Blends Volume 6, Template 2) by Jenn Lindsey and Dia De Los Muertos by Bean Bunny Designs. Font is Popstar Autograph. Journalling reads: We always celebrated your birth on your birthday and mourned your loss on your anniversary. With the two dates being just 3 months and 4 days apart it was hard for us to ever find the chance to celebrate your life. Words can never begin to describe how grateful we are that we had you in our life even for the short while that we did. One day we were sitting together on the bed watching an episode of Handy Manny, they were talking about a day called Dia De Los Muertos, something I had never even heard of. A quick google search and look at Wikipaedia and I found what I was looking for “In most regions of Mexico, 1st November honors children and infants, dead adults are honored on November 2. This is indicated by generally referring to November 1 as DIa de Los Inocentes (Day of the Innocents) but also as Dia de Los Angelitos (“Day of the Little Angels”). Last year (2009) we decided that we were going to celebrate all three of our angel babies on 1st November. We stayed in a hotel, I bought a gift for each of the boys from our angels and we took a trip on the London Eye, so it felt like we were a little bit closer to them for a while.